At the beginning of August last year, you may remember I reported on the arrival at the Sanctuary of our stunning Spectacled Owl Cecil. As a brief reminder, Cecil was donated to us by Mr Brian Draycott as a poignant tribute to his late parents, for which we are very grateful. And Cecil has turned out to be a true star. Not only is he wonderful to handle, but he has also wowed our visitors for the last year with his striking appearance. 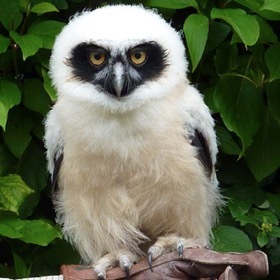 It was always the intention that Cecil should have a mate, as owls do like to pair for life, but the spectacled owl is an exotic bird and it was unlikely that we would be able to find a female before this year. So it’s with great delight that we are able to announce the arrival of Phyllis, future spouse to Cecil. She hatched in May of this year in Oxfordshire and is currently residing in one of our weatherings to give her time to settle and get used to visitors. Once she is ready, she will become the newest member of our flying display team, replacing her husband-to-be Cecil, who will then retire to an aviary for a well earned rest. As yet, Cecil and Phyllis are too young to breed and so the idea is that they will remain a part of the display team for the next three years. Then, once they are both mature enough, they will be paired into an aviary and we will await with bated breath the sound of tiny talons. Nemo hatched in early May and has come to reside with us courtesy of our friend Mike Cady. Her parents were originally imported from the Czech Republic and we hope that she will help to provide a new bloodline for the UK population of Northern Hawk Owls. It is vitally important that new bloodlines are introduced from time to time to avoid interbreeding, which can result in birth defects. Again, we are hoping that Nemo will become part of our flying display team and perhaps also be one of our course birds. The Northern Hawk Owl is so called because of its distinctive likeness to a hawk. The greyish colouring and barring on the chest are very hawk-like as is the colouring on both wings and tail. Northern Hawk Owls originate from the boreal zones of North America and Eurasia and inhabit open coniferous forest and moorland. Their plumage offers ideal camouflage for this kind of habitat. Northern Hawk Owls mainly eat small mammals particularly lemmings and voles, but will also catch birds, frogs and, unusually, even fish.